hile the Romans maintained possession of North Britain, they had a station on the spot on which Glasgow is now built, and being within the wall of Antoninus, which crossed the island from the Forth to the Clyde a few miles to the north, it was included in the province of Valentia, and was retained by this warlike people till their final departure from Britain. The name of Glasgow has to be derived from the tongue of the original British, but with much uncertainty in the etymological signification. By some the word is said to import a grey smith, which is, indeed, the most literal etymon, while others understand it to mean a dark glen, in allusion to the ravine near which the earliest settlement was made. Which is the most correct explanation no one can now satisfactorily declare. The congregating of houses in this part of the country, begun by the Romans, was in a century and a half after their abdication hastened by the establishment of a cell by a certain religious recluse, entitled Kentigern or Mungo, who, according to the usages of the age, was elevated to the character and appellation of a saint. St. Mungo, whose apostolic labours coordinate with those of the sainted Columba of Iona, christianized the western part of Scotland, and who flourished in the latter part of the sixth century, is reported, by an obscure tradition, to have been originally an orphan, in the most destitute circumstances. While an infant, he was exposed by his parents on the north shore of the Firth of Forth, at the place now called Culross, where he was nurtured and instructed by the pious Servanus, or St. Serf, a religionist, whose footsteps he followed, and whose pious actions he emulated. After various peregrinations, he settled in Glasgow, where he had a cell, and here seems to have acted at once as the bishop of an extensive diocese, and the instructor of the inferior clergy, or others whom he despatched as missionaries into different parts of the country. Among those whom he thus deputed, was the famed St. Baldred, an intrepid priest, who accomplished the christianization of the eastern part of Lothian. St. Mungo is said to have founded a regular church in Glasgow, 580, and having lived twenty-one years thereafter, died 601, bequeathing the infant Christian community his blessing, in the simple phrase, “Let Glasgow flourish,” — a sentiment commemorated as the motto of the episcopal and afterwards of the city arms, and which modern times has certainly seen fulfilled to a most unlooked-for extent. If the origin of Glasgow be attributed to the period of its rise under St. Mungo, it will appear that the town became known at the end of the sixth century, an epoch almost coeval with that of the commencement of the city of Edinburgh. For many ages, Glasgow continued to be little else than the seat of a religious establishment, with the necessary secular hamlet to aid in its subsistence, and its advance was doubtless retarded by the disasters of the Cumbrian kingdom of Strathclyde. At an early period, the town was constituted an authoritative episcopal see, with a very extensive diocese, which comprehended the whole of Dumfries-shire, the eastern part of Galloway, lying between the Nith and Urr, all Roxburghshire, except a small part on the north of the Tweed, the whole of the shires of Selkirk, Peebles, Lanark, Ayr, Renfrew, Dumbarton, and more than half of Stirlingshire. It was divided into two archdeaconries, namely, that of Glasgow and Tiviotdale. In addition to the deanery of the cathedral church and chapter, the bishopric was divided into ten deaneries, containing 255 parishes. Cathedral and Part of the City of Glasgow from Craig Park. Drawn by D. O. Hill and engraved “on steel” by T. Clerk. Published by Thos. Ireland, 57 South Bridge Street 1838. Facing p. 463. Chambers 1838 Gazetteer of Scotland. Click on image to enlarge it. The cathedral was dedicated to St. Mungo, who, it may well be conjectured, was constituted the patron saint of the town. From the death of this personage till the year 1115, a period of five hundred years, embracing the whole existence of the Culdean system of worship, the history of the episcopate of Glasgow is a total blank. It would appear, that some time prior to 1115, there was no bishop in the diocese, and that the church was in a lamentable condition. From this state it was happily rescued by David, Earl of Cumberland, the brother of Alexander I. This prince restored the see of Glasgow, and appointed his own chaplain, a learned and travelled man, to the vacant episcopal chair. David, who was subsequently king, under the title of David I., was a beneficent patron to the see, and did much to restore and extend its privileges. William, his grandson, surnamed the Lion, was likewise a benefactor to the place. Bishop Joceline, about the year 1172, gave Glasgow certain burgal privileges, in order to encourage its inhabitants to commerce and trade; and from this time, according to that garrulous historian of the city, John M'Ure, "the town had always something like the face of business." The privileges of Glasgow as a burgh of barony were subsequently extended by different monarchs. Alexander III. in 1277, gave a charter to the bishop, who was the superior of the town, empowering his burgesses and men of Glasgow to trade to Argyle and Lennox, and throughout Scotland, as freely as the burgesses of Dumbarton, or of any other burgh. The corporation of the town then consisted of a provost and bailies, with twelve councillors. Two circumstances next concurred in extending the town of Glasgow. The first of these was the building of a stone bridge over the Clyde by bishop William Rae, about 1350, which, by causing a confluence of travellers to this point, must have been of great service in inducing an increase of population; the second was an enactment of bishop John Cameron, about the year 1428, compelling the constant residence of his prebends in houses of their own erection. The next measure which tended to increase the consequence of Glasgow was the erection of a college by bishop William Turnbull, in 1452-3. James II. granted a charter to this learned prelate and his successors, in favour of the town and barony of Glasgow, and the lands called Bishop's Forest, constituting them into a free regality; a jurisdiction of a more potent nature than that hitherto in force. While under this species of government, its magistrates were ordinarily powerful nobles in the west of Scotland, who were at once rigorous in the preservation of peace, and tyrannical in the exercise of their functions. 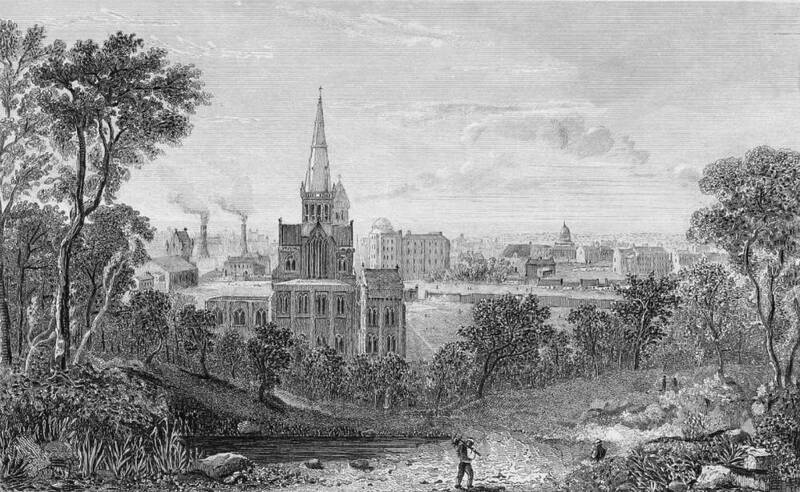 The history of the rise and progress of Glasgow is little connected with the memorable transactions of the kingdom. In 1300, the town was the scene of a bloody conflict between the troops of Edward I., who were intruded on the town, and a band of Scottish patriots headed by Sir William Wallace. The meeting took place at night on the High Street, and being conducted with much skill on the part of the Scots, they were completely victorious. Wallace had the satisfaction of slaying the Earl Percy with his own hand, and also of seizing the Bishop's Castle, which was a place of some strength. In 1348, a parliament of the nation sat at Glasgow, which is the only instance of a meeting of the kind taking place here. In 1488, an act of parliament was passed, erecting Glasgow into a metropolitan see, such as the archbishoprick of York, a distinction it preserved till the final overthrow of episcopacy. Chambers, Robert. The Gazetteer of Scotland. Glasgow: Blackie and Son, 1838. Internet Archive online version digitized with funding from National Library of Scotland. Web. 30 September 2018.